BLUE CARBON IN SEAGRASS MEADOWS! So lucky to be invited to actually look at what marine ecologist do in our local waters. 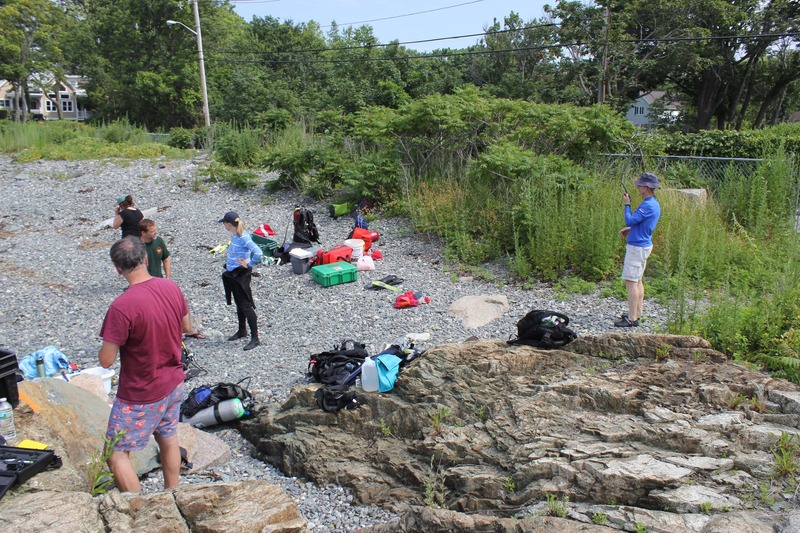 Met Phil Colarusso and the EPA team around 10am in a small cove in Nahant. 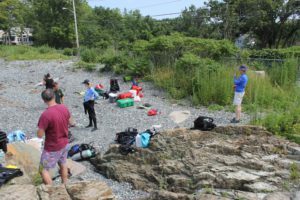 Everyone had already taken over the beach with the scuba gear and equipment. I wasn’t exactly sure what I was supposed to do so I said hi and waited. Phil Colarusso and the team of Divers from the EPA were there test water quality around a patch in the seagrass meadow. Lists and equipment checks were completed. 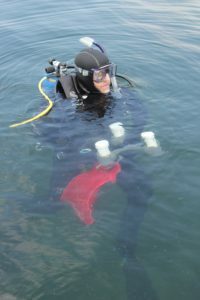 I never realized how important safety is with this type of diving research, I was learning fast. Jean was stationed on shore to make observation from the coast making sure that the crew on the boat were not missing anything. I got to go on the boat and take photos of the dive from above (how cool!). On the boat we had captain Bill Osbahr, and his mate Nick Bobbs, Sarah Driscoll from the New England Aquarium was there for seagrass research. 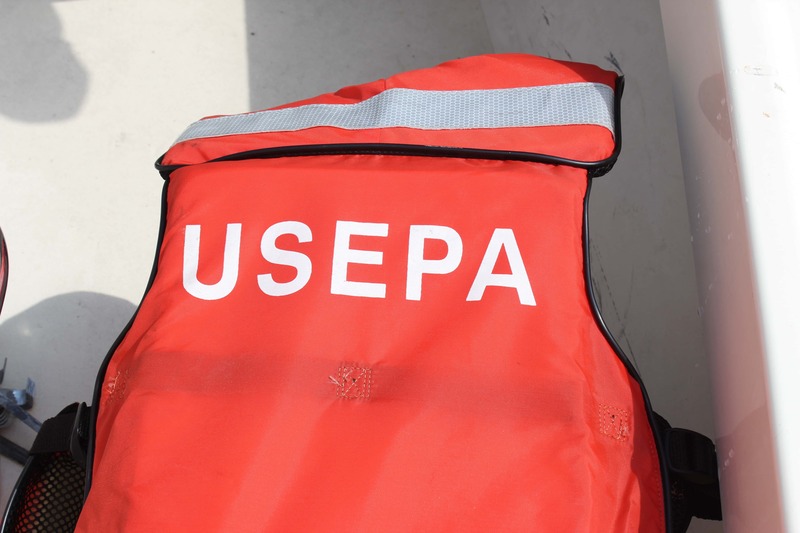 We all put on our EPA safety vests and got circling around the divers. 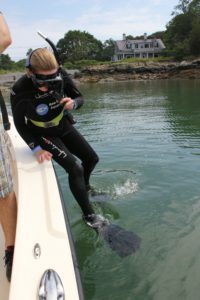 The boat was there first for protecting the divers against other boat traffic and second for recording data. Nick started preparing the sediment traps, a triadic device with honey cone like filters for catching anything that floats in. 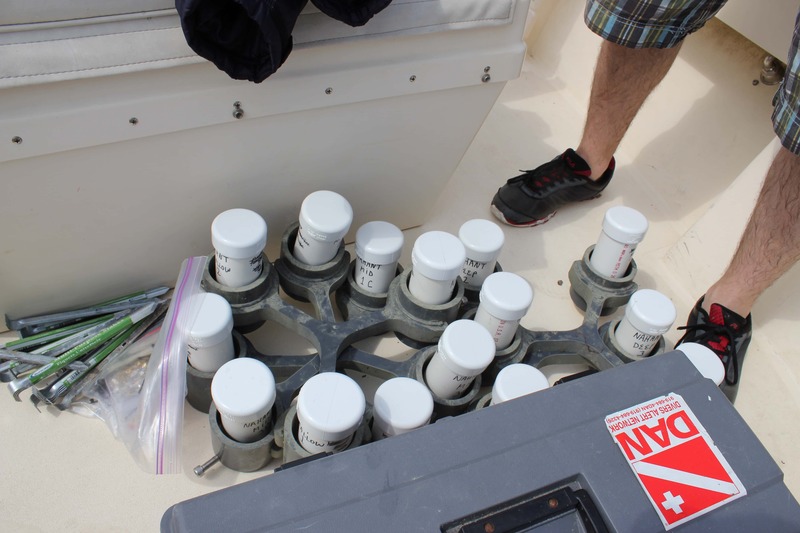 These sediment traps were being placed today and would be recovered in two weeks. 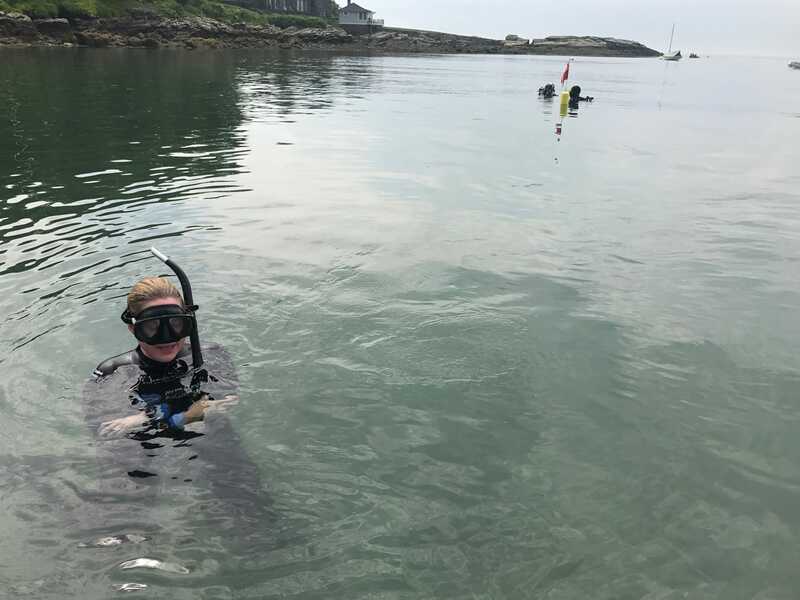 Boston EPA’s Phil Colarusso and team are out on the field gathering information for Blue Carbon analysis of eelgrass meadows. 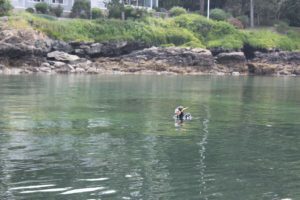 How Seagrass (Eelgrass) helps hold down carbon from the atmosphere. The divers had five sites mapped out for placing the sediment traps. 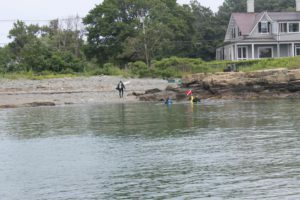 Each time they swam to the new site, the safety flag and boat followed the divers. Since the water was only 59 degrees, Bill Osbahr kept checking on the divers to make sure they were OK for heat and air. 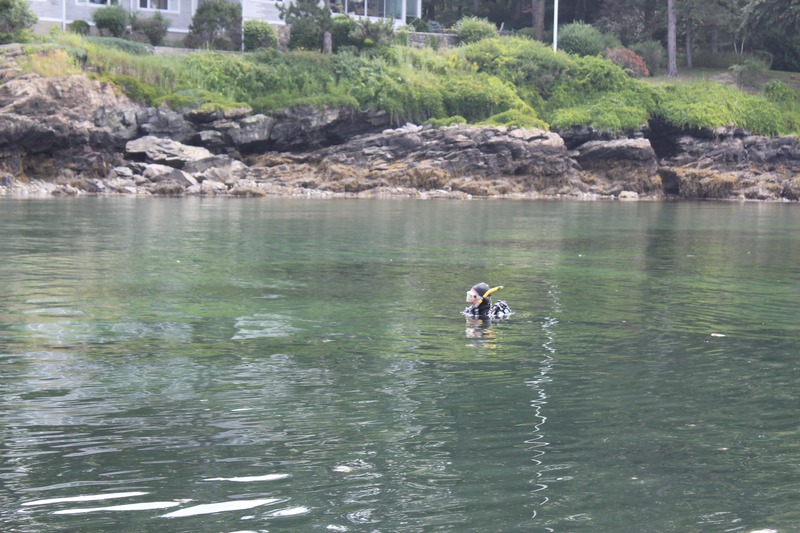 The boat’s GPS system and markers from before helped the divers find test sites in the eelgrass meadow. When we checked on the boat we were about 17 feet from the bottom. I loved how everyone worked so effortless in unison, very little talking and lots of paying attention. In this Photo below, you can see the darker areas is where the seagrass beds are. The lighter areas are sand. After our trip I was so curious had to learn more about the what, why, and hows. Luckily Phil is super patient and was gracious with his time. NA: What is blue carbon and why is it important? PC: Blue carbon is carbon associated with seagrass, mangroves and salt marshes. This is carbon in the plant tissue and in the sediments below the vegetation. It is important, because the carbon in these sediments are sequestered, thus they do not contribute to ocean acidification or global climate change. NA: Basically the seagrass meadows takes Carbon form the atmosphere and holds it down in the peat below its roots so we don’t have as much in the air. I have read about this but never seen it tested!!! So when we dredge or destroy the seagrass beds are we kinda doubling the carbon dioxide in the air? First from destroying the natural habitat that stores in, and in the process of destructing it potentially releasing more Carbon into the air? PC: Yes, when we lose these habitats carbon that has been sequestered for tens, hundreds of years can be mobilized back into the ocean and atmosphere. The factor is much more than a doubling but more likely a factor of 100. NA: How does the eelgrass meadow we went to today relate to blue carbon? PC: We have sampled the meadow in Nahant for blue carbon for the last 3 years. We have estimates of total carbon in each of the meadows we sampled, but I don’t have those numbers at my fingertips at the moment. 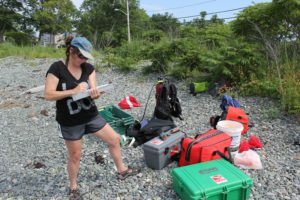 NA: You had 5 sites for the sediment traps what are you monitoring that relates to blue carbon? PC: Todays sampling is an effort to better understand the spatial differences within a single meadow. 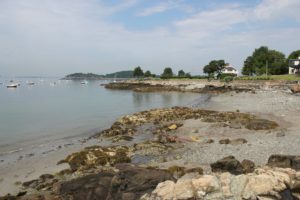 The density and size of plants varies within individual meadows, especially if they span a depth gradient like the meadow in Nahant. From prior sampling we know that a lot of carbon comes from outside of the meadow as it floats by in the water column. 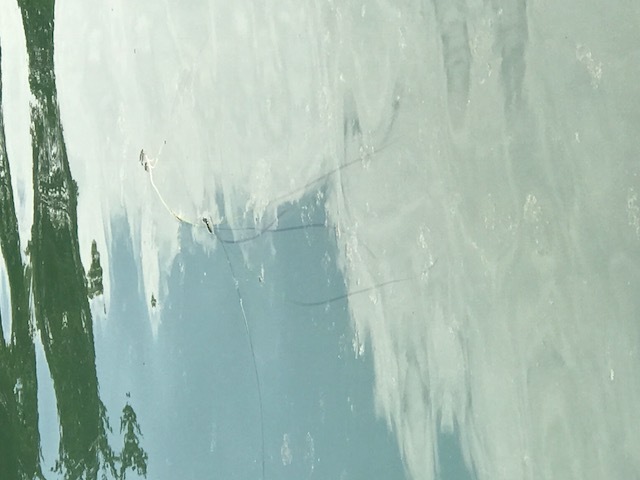 What causes these floating particles to settle out in eelgrass is the presence of the plants sticking vertically up into the water column almost catching these particles as they drift by. Our theory is the more shoots and the larger the shoots, the greater the quantity of drifting material will be collected. Thus, we will see how much material each trap array collects and see if there is a correlation to shoot density, plant height and a few other parameters. NA: So do the sediment traps help establish where the carbon comes from? Inside the meadow or outside can you tell? 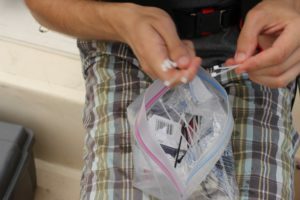 PC: Yes, we test the material collected in the traps. We use stable isotopes to determine the likely origin of that material. From prior sampling, we know that a very large percentage of material originates outside of the meadow. NA: Do we want to find out if more sediment and carbon is caught in long dense seagrass beds? IF so does it means that it would be beneficial for us humans to plant more seagrass? So it can clean up more gunk in the water and reduce our already bewildering rate of CO2 in the atmosphere? PC: Our hypothesis in this experiment is that meadows with higher shoot density and bigger plants will collect more organic particles and carbon. Restoring seagrass is definitely beneficial for carbon storage. In Europe, one can restore seagrass and receive carbon credits which possess real monetary value. NA: How do you choose the sites you will monitor? PC: For this study, we were looking for a range of water quality (good to intermediate to bad) to sample. In addition, logistics such as accessibility and safety also play a role. NA: Previously you mentioned there are two ways of checking for Blue Carbon, one was with the sediment traps and the other was with the tubes that dig into the peat(sequestration)? PC: Yes, we measure carbon in the plant tissues, also in the material we collect in the sediment traps, but also in sediment cores that we take with the plastic tubes. These are 30 cm long by about 10 cm wide column of sediment that is below the meadow. This rich organic material is called peat. We subsample the 30 cm core into smaller sections and measure carbon and nitrogen in each sample. NA: In addition to the sediment core and the sediment traps you also do a third test, is that correct? Did you do the pin test today with the white ties? Is this to see how many off shoots the eelgrass will have in 2 weeks? PC: I did mark plants for growth today. We put a pin through the plant and come back in 2 weeks and harvest that plant. We peel back all of the individual leaves and measure where the pinhole is in each leaf. As the leaf grows, the pinhole migrates. Plants can add as much as several inches of leaf growth per day. NA: Do you create a log, what do you do with this information? Does this get put into charts or database? PC: We do have a field log book, where relevant information, observations and other notations are recorded. Data is ultimately recorded into electronic databases. As we collect data, we generally analyze much of it as we go along. That way, we can refine our sampling to take advantage of any unexpected findings. The ultimate goal of any scientific endeavor is to provide information that decisionmakers can use to make better choices. As part of that process, we share that information by presenting our work at conferences and publishing the work in peer-reviewed journals. NA: Do you communicate with the team members underwater? PC: We usually try to communicate exactly what we are going to do before we go under, so everyone is clear on their assigned task. We have limited communication underwater usually via hand signals. NA: How tall were the seagrasses where we were today? PC: They were in the 3-4 foot range. NA: We were hot on the boat 80 degrees but the water was 59, how long should you be in the water when its that cold? PC: 59 is not bad, when we started working this spring it was 44. We can stay in until we run out of air, which can be a long time at such shallow depths. 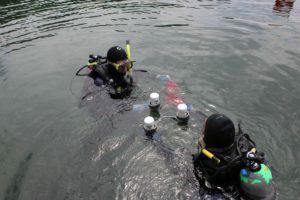 Each diver has their own temperature tolerance. I do pretty well, better than most in cold water. 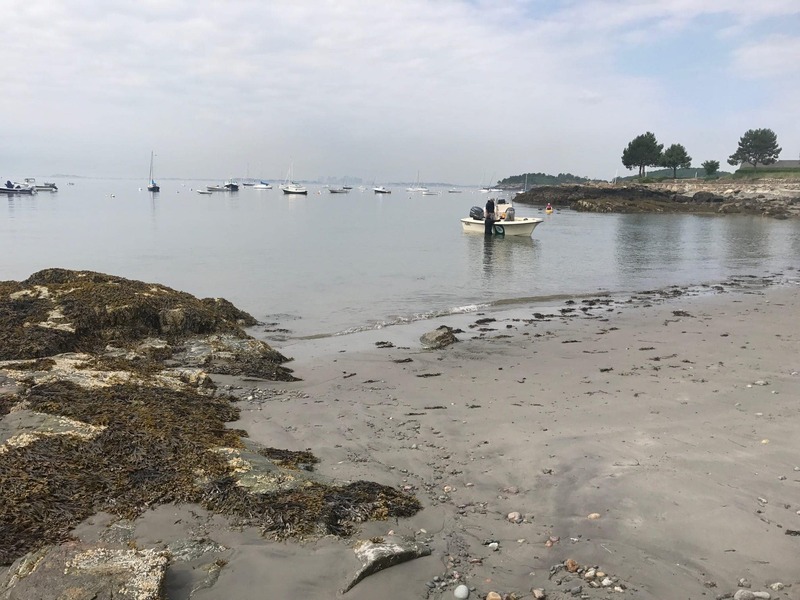 NA: When I looked down there were dense patches of seagrass, was this an indicator of good health for the eelgrass beds, does the height matter? PC: Density is a better indication than height of meadow health. Dense seagrass is always a good sign. NA: How often do you check this site, why is this a good site to focus on? We could see Boston from the boat, do you check to see if it correlates with what the eelgrass does in Boston Harbor? PC: I have been doing work at the Nahant site off and on since 1993. Part of my PhD work was done in that meadow and I’ve done a number of other studies there. I think I’ve now logged over 100 dives in that one meadow, so I feel that I know it quite well. It is different than Boston, but because we have so much historical data there it makes it a great site to work at. NA: That’s great, it’s awesome that you can keep coming back and keep track of the meadow. What are some of your findings in this site? Has it changed much? Grown? Declined..Has the Boston harbor sewage clean up with the new deer Island facility made a an impact here in Nahant? PC: I think that I have completed almost 100 dives in this meadow. I feel like I know it so well. There certainly has been some ebb and gain over the years, but for the most part this meadow has been remarkably stable. The change in sewage treatment and move of the Boston outfall has not had resulted in any discernible change on this meadow. 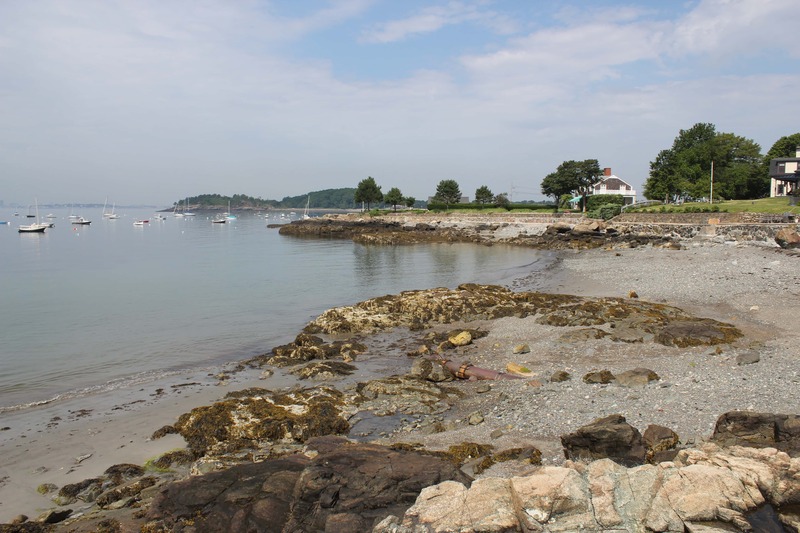 NA: How is this site different than the eelgrass in Boston? 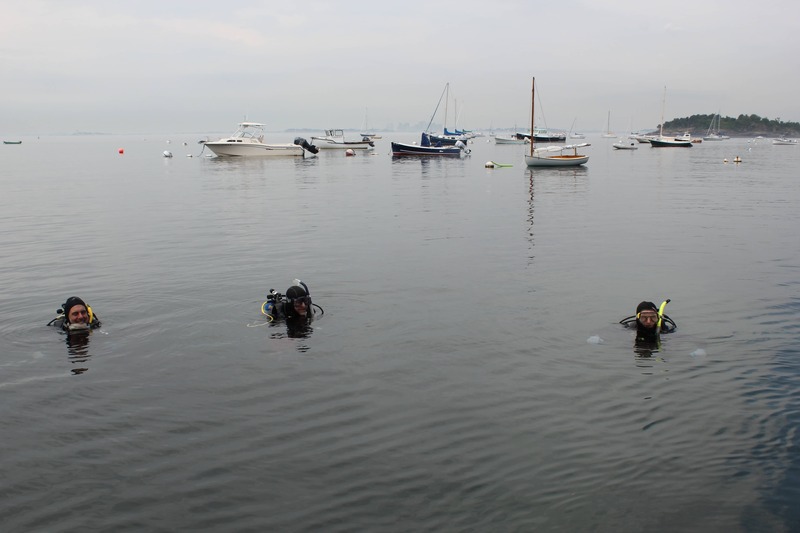 PC: This site is more well flushed than Boston Harbor, so water clarity tends to be better. There are boats moored in this cove, but it tends to be less busy than Boston Harbor, which makes it easier for the divers. NA: How was the water quality today? I took photos of some brown stuff, was this algae? If so do we know where this comes from sewer/runoffs from fertilizers? Will the sediment traps be able to tell us? PC: Water quality was generally good with visibility being 15-20 feet, which is pretty good for July in Massachusetts. I believe the brown stuff was algae. 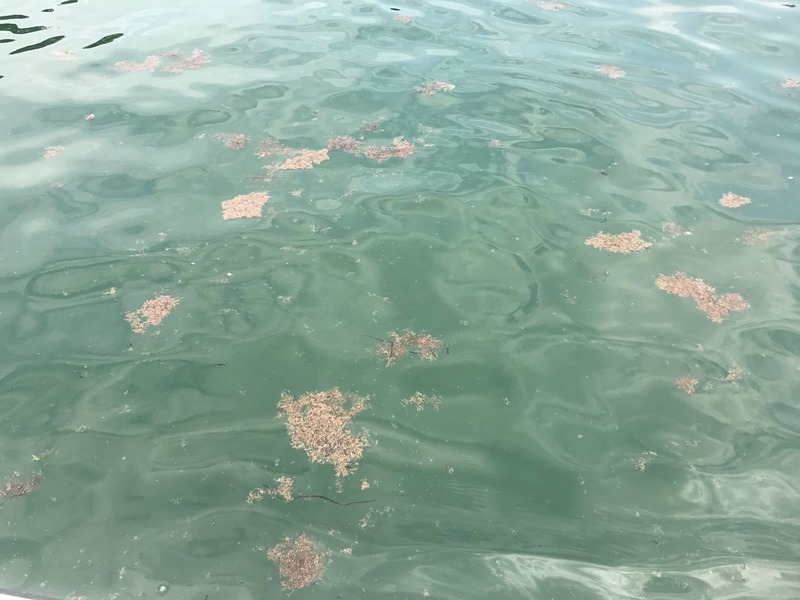 The MWRA reported seeing a large floating mass of this in Boston Harbor and they ID’ed it as algae. They may have more information on it on their website. 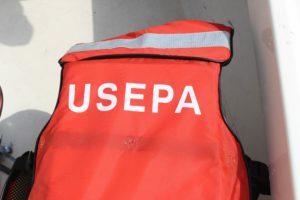 NA: What is the MWRA? PC: The Massachusetts Water Resources Authority. They run the Deer Island wastewater treatment facility and do a tremendous amount of monitoring in Boston Harbor. NA: Is there an emergency action plan in place to deal with too much algae, if we have some kind of weird outbreak? PC: We do experience periodic outbreaks of algal proliferation for a wide range of reasons. Many of these are short term in nature and may not be aesthetically pleasing, they may not pose a significant ecological threat. NA: What’s the most challenging thing while conducting this type of field study? PC: Dealing with the stuff that I can’t control, such as the weather. Today conditions were very favorable to work at that site, but if we had winds out of the south, waves would have picked up and visibility would have declined greatly. 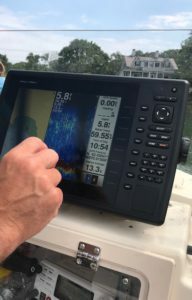 We sometimes work in areas where we need to do things almost exclusively by feel because water clarity is so limited on the day we are there. NA: Yes I noticed just in our couple of hours we were out the sky changed from sunny to cloudy, there were even some rumblings from afar. What other variables do we need to consider while conducting these test? PC: There are a long list of variables that I consider and they vary by what research question I’m asking. 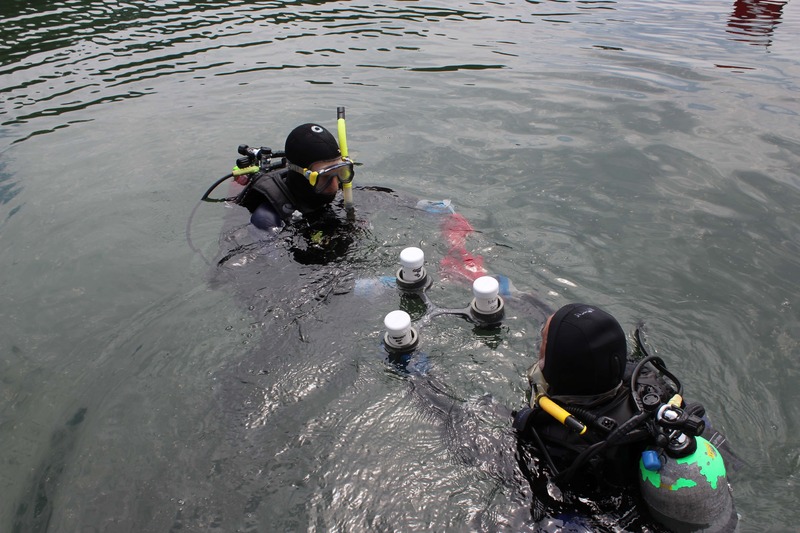 Safety is the one variable that is constant on every dive. Are conditions safe enough for us to do our work. 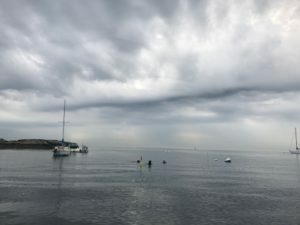 We were out in Boston Harbor a couple of weeks ago and due to the strong currents and the large number of boats present, we opted to cancel our work for that day. NA: You really are at the whim of nature, after the clouds, we saw the sun again! One quick question, when will you do that third test? The sediment cores? PC: We are at the whim of nature, but we have a saying it never rains underwater. Wind and lightning are more problematic for us. No one wants to be out in the water when there is big winds and thunder and lightning. We have already taken sediment cores multiple times from this site and that data has already been processed. PC: This work requires an amazing team to do it well. Today you met about half the people involved with this project. 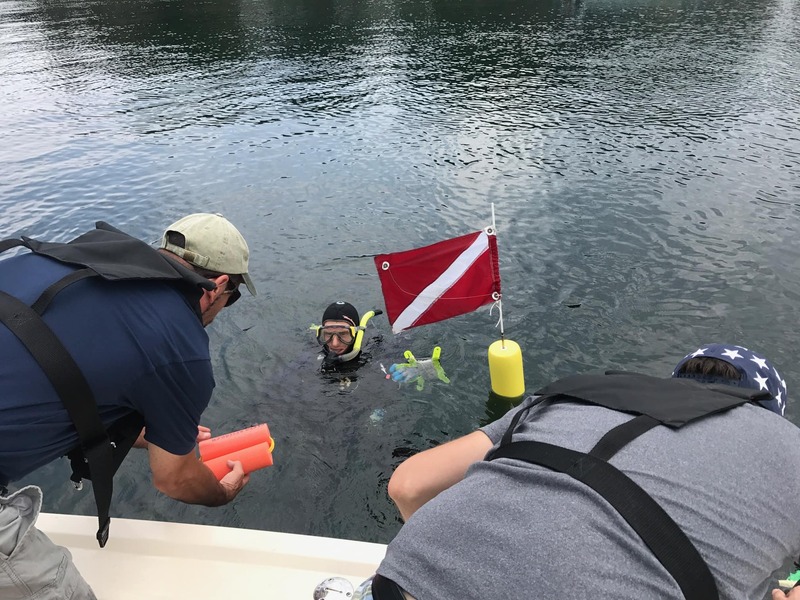 Our dedicated dive team (Jean Brochi, Chuck Protzmann, Eric Nelson and myself) who couldn’t get this work done without boat support from our Chelmsford Lab (Bill Osbahr, Tim Bridges, Nick Bobbs). The other half of our team involves the many hours of working in the lab processing samples to generate the data, those folks include Peg Pelletier and Nicole Gutierrez from EPA’s Narragansett Lab, Julie Simpson from MIT SeaGrant, Alyssa Novak from Boston University and Ariane Arias Ortiz from the University of Barcelona, Spain. A team of all stars in my book. NA: What an amazing experience, thank you for letting me tag along!